Block in the animation for every shot of sprint two (IAC 30 – 50, IA 50, EAC 10 – 40, EAC 60). Another solid week of a lot of animating and not too much else. Everything is fairly smooth sailing. Summary: Spent a lot more time animating. A few more shots need just a little more polish before the end of the sprint, but we can do it. Gabe and Pat and I also spent a few hours together doing a deep critique of each others’ work. I wish we’d done it sooner, as we got great stuff and unfortunately some of it required some rather involved changes. Positives: Looks great, almost done! Summary: We all got together and went over our options with clothing. Anthony was able to demonstrate pretty much right in front of us the power of Marvelous Designer, and easily convinced us that was the route to take. 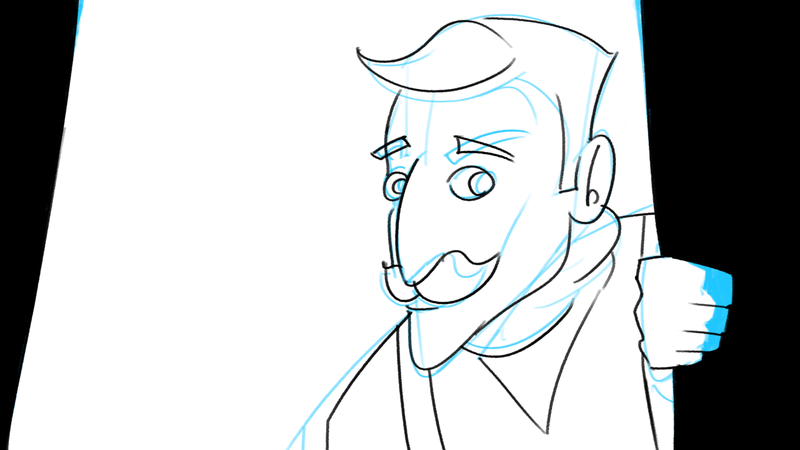 Good, solid week of animating. Was able to take some feedback from Nick and the team regarding some of the acting decisions in two of my shots, and they’re looking sweet! Also met with Ethan, Pat, and Val to hash out the minutiae of shot timing and some editing things. Summary: Animated a lot. Got two scenes through splining (the two most acting heavy) including one whole round of revisions, and got tight blocking on the other shots. 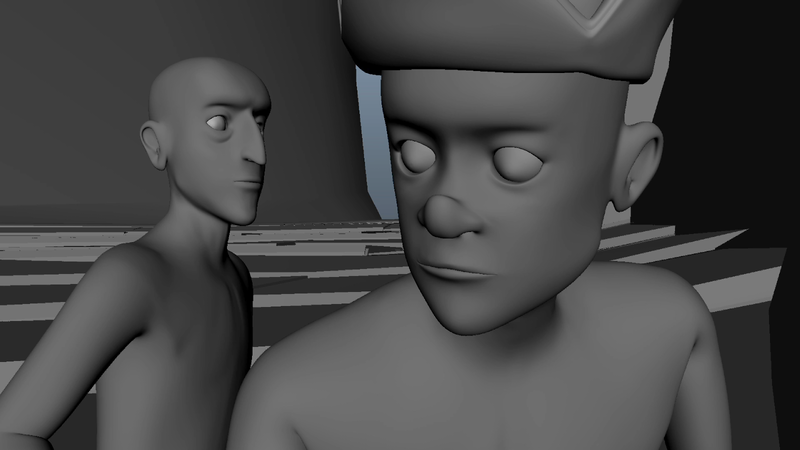 I’m currently working on the facial animation. Positives: Everything’s going well and the new facial rigs are awesome! Summary: Figured out some editing things with Ethan, Pat, and Val regarding the the timing of specific shots, so we now have our shot lengths locked down permanently! With this comes locked down audio tracks for lip-syncing, so yay! Also tweaked the storyboards to reflect some edits. Positives: Animatic looked nice and I think Nick liked everything! Break Summary: Didn’t spend nearly as much time as anticipated on the project over break, but I was able to continue blocking in some more animation. Not much to report on, really. I also worked on grabbing the audio and working into the animation that I had, but ran into some difficulties there that Ethan has since helped me sort out. Summary: Finished the boots for the characters, which meant more research, design-work, modeling and UV-ing. Unfortunately, this was one of those things that we hadn’t thought through, figuring “boots are boots.” Turns out, boots form the period are quite different than snow boots today, and required quite a bit more design than sticking the characters in UGGs and calling it done. After this was all done, the pants needed to be modified to fit the boots and each individual character. Summary: Worked on bringing the interior tower shots to a more polished stage. 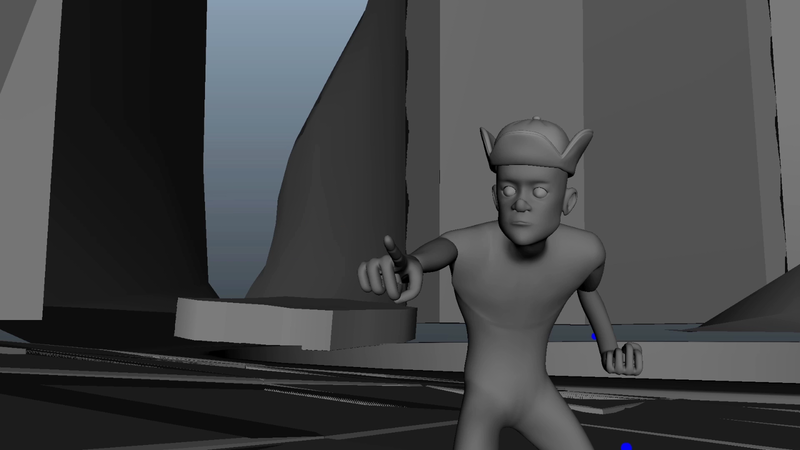 We’re hoping to have this entire scene done in a few weeks (animation-wise) so we’re really cranking hard on it. Because of the unexpected time spent on the clothing and the general lack of productivity due to being back from break this week, I wasn’t able to get much done but I fully expect that to change this upcoming week. Not a whole lot to report this week, just continuing to pump out some more shots that need to be blocked.